Charter Schools in the U.S.
One of the issues at the forefront of contemporary education reform is that of charter schools. Seen as an innovative solution to failing public schools by some and as a drain on public school resources by others, charter schools are a controversial topic with advocates and opponents on both sides of the aisle. In general, charter schools are free from many of the state and district regulations that traditional public schools must follow. Furthermore, charters remain accountable to the state and must maintain good results or else risk having their charter revoked (NCSL, n.d.). However, different states take very different approaches to charter schools. 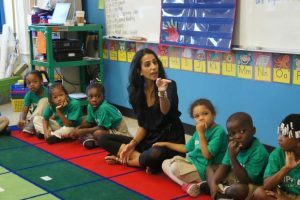 How many children attend public charter schools? Between 2001 and 2015, the percentage of children in American public schools who attend charters increased from 1% to 6% (NCES, 2018b). In the same time period, the percentage of public schools that were charters grew from 2% to 7% (NCES, 2018b). As public schools, charters must accept any student who applies and must use a lottery if more students apply than they are able to accommodate (Candal, 2009). However, due to charters’ location and targeted advertising, the demographics of charters differ significantly from those of traditional public schools. Compared to traditional public schools, charters are more likely to . . . The MA Education Reform Act of 1993 authorized the creation of the first charter schools in Massachusetts (MA DESE, 2018). When charter schools were initially introduced in MA, they were seen as an opportunity for innovation which could be used to inform best practices in traditional public schools (Candal, 2009). Since then, charters have been the site of various conflicts within education reform in MA. In 2017, there were 81 charters in MA with a total of 44,200 students (NAPCS, 2017). Characteristics of charter schools in MA include “no excuses” policies, lengthened school days and school years, mandatory after-school tutoring, and a focus on basic literacy and numeracy (Candal, 2009). Since the creation of the charter school law in MA in 1993, there has been a controversial cap limiting the number of charter schools allowed in the state. As of 2017, MA was one of 23 states with such a cap (NCES, 2017). The cap originally allowed only 25 charters in 1993, but it was raised to 50 in 1997 with new legislation (Candal, 2009). In 2000, the cap was lifted again to 120. Despite these lifts to the cap, charter school opposition remained strong. In 2004, the charter school opposition attempted a moratorium on charter school creation. In 2016, there was a ballot initiation to lift the cap on charter schools again. A “yes” vote on the Massachusetts Authorization of Additional Charter Schools and Charter School Expansion Initiative (Question 2) would have allowed the MA Board of Elementary and Secondary Education to authorize up to 12 new charter schools or charter school enrollment expansions per year beginning in 2017 (“Massachusetts Authorization,” n.d.). Question 2 was the site of a large and contentious debate between education activists, politicians, parents, and teachers over the place of charter schools in MA. In the end, the initiative did not pass, and the current cap on charter schools remains. To learn more about the grassroots organizing that took place during the lead-up to the 2016 election in MA, visit the Grassroots Organizing page.